Trends in Web Design are an interesting beast, as we don’t want to always follow what is ‘on trend’ but we cannot ignore where styles and the future are moving either. Web design is all about creativity, which often means running the opposite direction from what’s trendy. But some current trends are already showing themselves in 2019 – and we love them! Sure, some have to do with user accessibility, while others deal with aesthetic appeal, but many deal with your specific company culture, your brand, and your business’ unique feel and ‘why’. At JSL Marketing & Web Design, we are all about your ‘why’ and have been for years. So, we are happy that trends seem to be finally catching up with our values and views on uniqueness, creativity, clarity, and authenticity. Read on to learn the best and brightest trends coming for web design in 2019! Videos have been climbing in popularity since 2016, but 3D graphics, ‘glitch’ videos, and creative illustrations are now joining video as a web design trio. All of the above seem to be growing as companies and websites try to keep customers on their sites for longer with interesting graphics, videos, colors, and more. 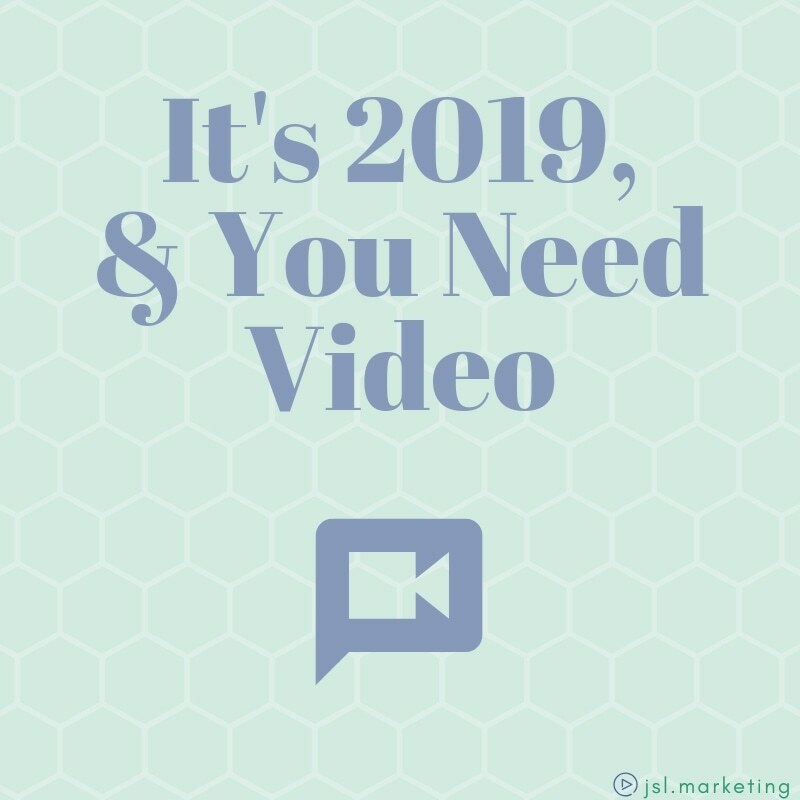 Whether you are using video for a personal connection, information, advertisements, or humor, this trend seems to be here to stay – which is just what JSL Marketing & Web Design likes to see. There is a certain beauty to using multiple mediums to reach your audience, and we don’t mean paper ads in conjunction with digital marketing, radio, and/or TV commercials. We mean the multiple mediums of 2019: picture, video, social posts, content, culture, and more! Sprouting directly off of our ‘multiple mediums’ segue, branding and brand identity is more important in 2019 than ever before. And developing a brand identity (and incorporating this into your website) doesn’t just mean using specific colors or fonts – though this can be important for recognizability. Brand development is about creating a certain look and feel for your website, with the ultimate goal of leaving that same impression in your customers’ minds when they think of your business. Many companies are allocating funds to their branding in 2019, whether that is to become leaders in their industry or a company that has positive reviews and culture with their target audience. It is becoming more and more apparent that a strong brand and brand identity is the cornerstone of a successful year. Piggybacking off of branding is industry-specific colors. Some industries are using more muted, subdued or pastel colors for their website redesigns, while others are using big, bold, bright colors to personify their brand. But then what is the trend? Pastel or bright? Bold or subdued? Well, that depends on your industry. In general, it seems that creative companies, such as website designers, photographers, digital artists, videographers, fashion agencies, and the musically inclined, are using brighter colors to showcase their website. On the flipside, many of the more traditional industries are softening their colors for a calmer, more serene new year. This trend depends fully on your understanding of your industry and the direction you want to take it. Consider a foray into color psychology if you are still deciding on your branding, colors, or website redesign style in 2019. When the JSL Marketing team heard about this trend, we were elated, as content is something we adore. 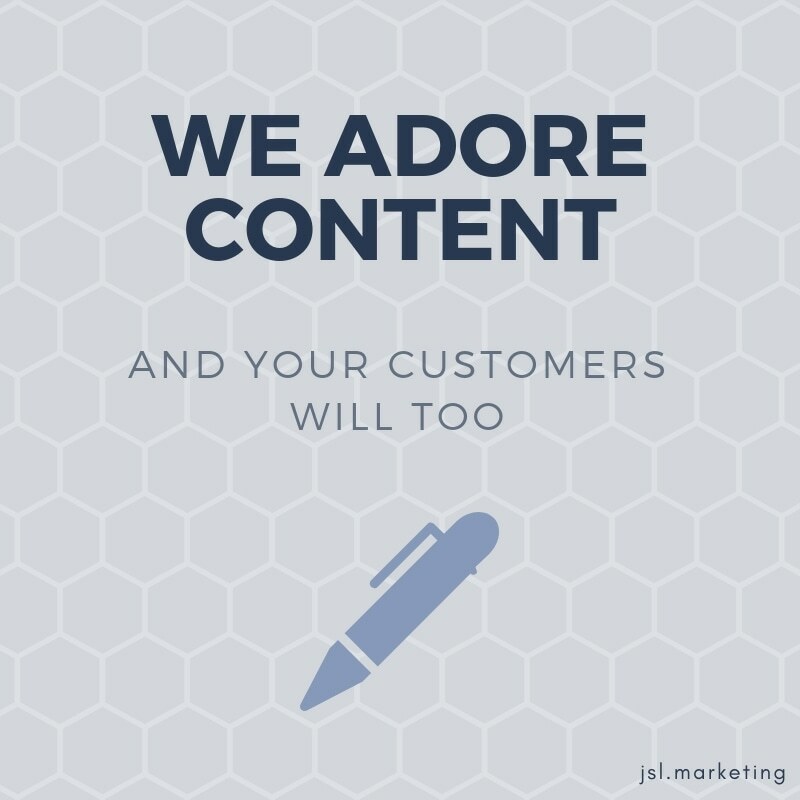 And not only do we love content and writing, we are always working to improve upon our content skills – both for clients and for those dreaded Google updates. If the content on your website isn’t worth reading, then why is it there? If your email marketing content isn’t interesting, then why are you sending it? And if your blog content doesn’t teach, delight, or intrigue its readers, then why are you posting it? Make sure your content – meaning every word on every page, blog, email, tweet, or text – is there for a reason, and is able to further nurture your company culture, brand, and ideals. And delighting your customers while you are at it doesn’t hurt either. This means you have a voice, you use humor as if you were speaking, you are authentic and friendly, positive and honest. Let your content speak for you this year, and always improve upon it. Need help with your content marketing or copywriting? Talk to our experts and learn how the power of words can help your business in 2019. Yes, writing is important, but where the writing isn’t can be just as important from a design point of view. White space is needed in order to not wear out the eyes of your reader, and Google likes it too. But the smaller ‘chunked’ paragraphs and short sentences aren’t going to cut it in the new year. Instead, this new web design trend of 2019 pushes minimalism in many ways by incorporating fewer words on home pages and above the fold, giving websites a clean look that invites the customer in. Sometimes what you don’t say can really matter, and white space plus minimalism is a great example of this. This trend will not work for every website, and in its extreme, it can narrow your customer base quite a bit, as they still need information and want to feel like you are being authentic and honest with them. Ultimately, this trend comes down to using your words – and white space – wisely. Maybe you think you don’t know what a micro-interaction is, but we bet you do, and we bet you’ve loved them. Think of a website, perhaps a retailer, that shows different views or angles of a product or outfit when you hover over it. Maybe a trail of color follows your mouse. Or maybe any items you hover over zooms or gains a new lighting or frame. These are micro-interactions or user-controlled changes, and they add to the user experience. Not only can they be a fun way to enhance your brand image, they can add a little fun to your website and create more of an impact on its users. If this seems the slightly eccentric cousin of minimalism, you aren’t wrong. 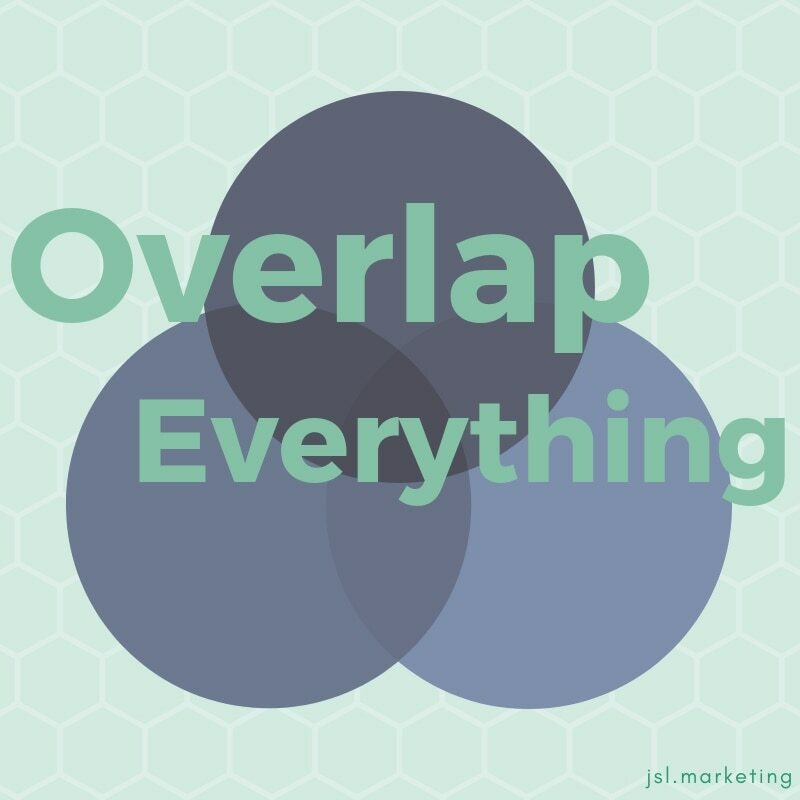 By overlapping tabs, backgrounds, pictures or styles, you can add visual interest to your website while still keeping it understandable with strong lines and stark contrasts. This overlap-style works with pastels, bolds, monochromatic, black and white, or anything in between as well. It is a great way to step into a bolder look without losing out on fun features, clarity, or content. Ultimately, you are trying to make your website represent you, so consider all aspects of your brand, design style, and culture when you decide if you want to follow any of the above trends or let them lie where they may. Join JSL Marketing & Web Design in the New Year. Let’s Make New Trends & Better Websites Together in 2019! Did the above trends in web design spark your interest? Or have you been considering an upgraded website for years but don’t know where to start? JSL Marketing & Web Design is a one-stop, all-encompassing, full-service web design company. And we can help you with your branding, marketing, content, SEO, website creation, and more. So, if 2019 is going to be you and your company’s year, then contact JSL Marketing today and see how we can harness the very best of web design trends for your needs.